Extra Virgin Olive Oil made from cold pressed Empeltre and Arbequina olives. 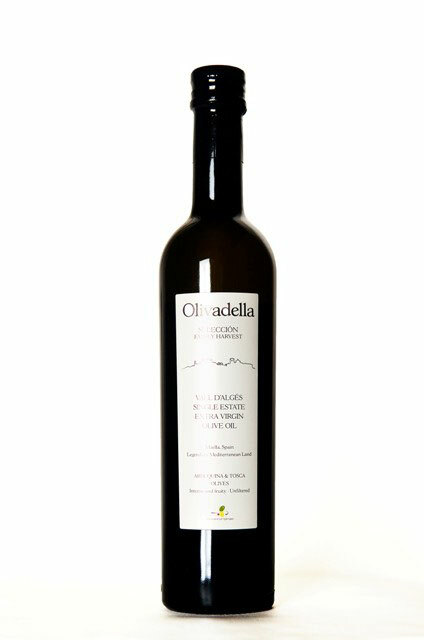 The olives used to produce this premium Extra Virgin Olive Oil have been specially selected from our own groves of centenary olive trees in the Mediterranean village of Maella and from small farmers’ groves around the area. Traditionally hand-picked using a method called vareo (tapping the branches) and using inverted umbrellas where the olives fall from the tree assuring the olives reach the mill in perfect condition. Olives are then crushed within 2 hours of harvest, guaranteeing oil freshness and premium quality. ‘Cold pressed’ at a controlled temperature, always kept under 27°C, assuring a perfect preservation of the olive organoleptic qualities. From these olives we obtain a clean, shiny, golden olive oil of a smooth, fruity and nutty flavour. This flavour blends with the vibrant scent of the fresh leaves from the Arbequina olive tree, resulting in a luscious delicate extra virgin olive oil. Every unit is freshly hand-bottled in our mill using 500ml. dark glass bottles for a better preservation of the oil proprieties. Limited edition. Acidity is less than 0.2°. Guaranteed purity. ´Bajo Aragón´ Protected Designation of Origin. Every olive used to produce this premium oil has been early harvested and specially selected uniquely from our own family grove in ‘Vall d’Algés.’ This wonderful valley boasts warm Mediterranean climate – dry, hot summers and cool, damp winters – which are optimum growing conditions for the best olives. 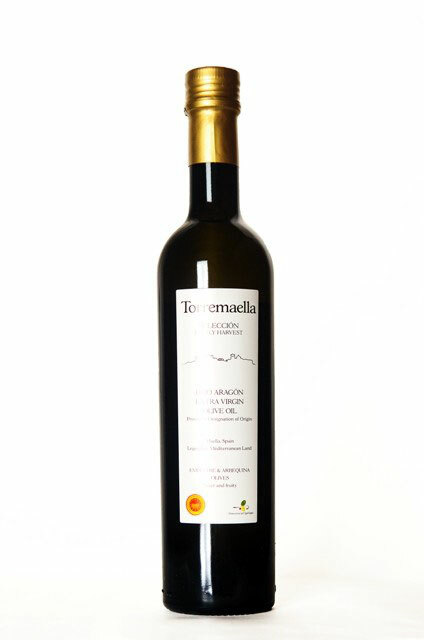 It is a blend of Arbequina and Tosca olives. Tosca is a variety of recent introduction in Spain with exquisite qualities for haute cuisine, being our small plantation – just 5 acres – the first in the country. All the olives are crushed within 2 hours of picking, guaranteeing oil freshness and premium quality, and ‘cold pressed’ at a controlled temperature, always kept under 27°C, assuring a perfect preservation of the olive organoleptic qualities. Bright green colour with smooth golden nuances typical from the Arbequina and Tosca varieties. Fruity, with an intense but delicate nutty and fresh leafy flavour. Excellent organoleptic qualities, enhanced by the artichoke and green olive nuances harmonized with apple and ripe olive of the Tosca variety. Every unit is freshly hand-bottled in our mill using 500ml. dark glass bottles for a better preservation of the oil proprieties. Limited edition. Acidity is less than 0.2°. Guaranteed exquisiteness. 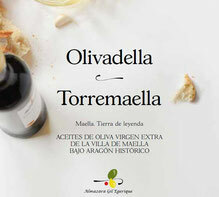 #Torremaella DOP Medalla de Oro en el Concurso Internacional de #aove#Terraolivo 2014 en Israel.